The water protectors—mostly women—from Standing Rock to feminist warriors fighting the construction of dams the world over, like Berta Caceres, assassinated for doing just this, to the women of Flint—mothers, usually—to women around the world spear-heading struggles to spare water. 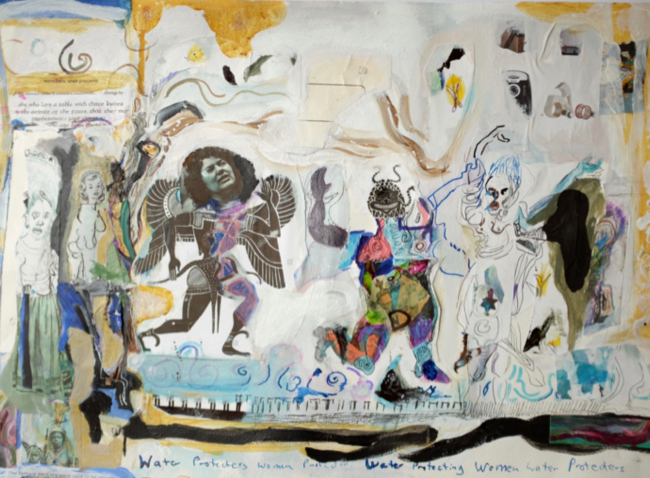 Women and water is usually a story of women standing with rivers and one another, and other beings both human and non-human. Standing with and for women and water, this is a we or sign of we coming alive as a body politic engaged in active cherishing of not only modes of self-subsistence made possible by life close to the source of life in rivers. It is also a we coming alive as a sign of standing for the group history buried along with other sacred offerings deposited by/in course of a river’s flow. As in the case of dams (built to power whatever new machinery of extraction is “planted”), water diversion is what distracts and drains water, drains from people whose livelihood is watered by the body diverted from its transaction with the world a felt capacity to act with others for change. No we won’t be diverted stated Berta Caceres who as indigenous leader, feminist activist, in Honduras enacted her refusal, tirelessly (she only took two vacations in her forty-six year old life) organizing her people to halt the production of The Aqua Zarca Dam in a series of other such struggles. She was a critical force organizing indigenous people, and women particularly, into a social movement. If politics is a miracle as Arendt—no magical thinker—states, this movement-making was indeed a miracle in a country long-quelled by dictatorship into a protracted state of political resignation. Flint happens; the water protectors at Standing Rock happen; and the assassination of Berta Caceres happens. The state (in Honduras) murders Caceres directly under shadow of Hillary Clinton—the shadow-side of “standing with Her” — and under the neon sign gushing warm new filtration systems rinse out our bones become pink-frothed in the wash.
Editor’s Note: Kathy died on August 1st. 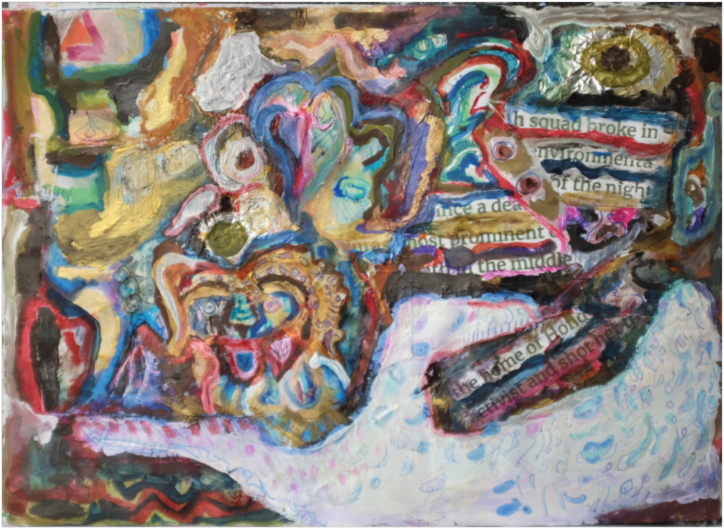 After her death, her partner Becca and I combed through her notebooks and selected both the writings that accompany her paintings and the following passages on art and healing (for more of Kathy’s writing, see https://kmiriam.wordpress.com). In the last months of her life, Kathy mentioned several times that she would love for her artwork to appear in Dark Matter: Women Witnessing. It is good to be able to fulfill that wish. 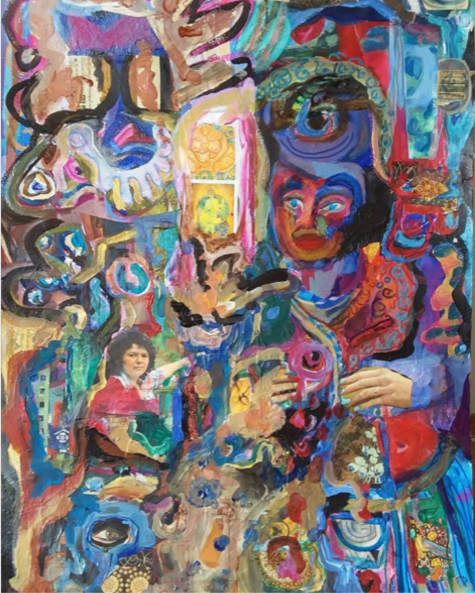 “I had long rejected the notion of art as healing partly due to my aversion to such prevailing personal-growth dictums as ‘art is self expression.’ Art as self expression—I much prefer art as experiment (this is Lynne Hejinian’s felicitous semantic swap) which evokes for me the spirit of exploration and play, the search for new synthesis—alchemy— new combinations and arrangements/dis-arrangements all in mad-scientist lab/studio. But I confess: the idea of art as healing or therapy or self- expression or as anything other than the practice of art itself is an idea that has always loomed as threat to the fragile (yet unyielding) construction of Identity. There is an ‘ego-thing’ about myself as artist-identity—of myself as worthy of the identity—that has always barricaded against realization my strong desire for beauty and pleasure and play. And yet I was pushed by the sudden surged escalation of my illness to reconsider my aversion to art as healing… Because it was at this moment—while and shortly after the first layer of recovery from my “coma” and hospitalization, when I came more directly smack up against a sense of mortality—that art surged up as if needed in a state of emergency. It really was my first reckoning with mortality and the shock had me spinning my wheels. My new sense of mortality acted on me as a gratefully received demand—the identity/ego now seen as barricade against the actually practicing of art and joy it could unleash for me. Identity/ego—a Western bourgeois construction of course—had thwarted my every fresh mark on the page. Art did unlock for me the secrets of movement when nobody meaning everybody was looking. Like upon my discovery of NIA dance studios and Five Rhythms dancing—both of these public forms of dancing without rules for purpose of healing yet also stretching beyond any privacy of expression into play with basic elements of movement and dance. Prior to the escalation of my illness, I had already risked dancing in ‘public’ (at a studio but also at outdoor live music concerts) and found ecstasy for the time in that mode—a sustained mode of play and creativity-through-play, necessarily communicative/inter-active. For me in my late fifties I found flirtation through dance for the first time. And found for the first time in my life a red balloon kind of lightness—the mystical in the ordinary. I first met Kathy Miriam in 2005 in her class on Philosophy and Feminism when I was a young student at the University of New Hampshire. During her years as a college professor, Kathy altered my life and the lives of many undergraduate students, mostly women. Kathy had a gift for drawing her students into group discussions that demystified dominant ideologies and unveiled our lived experiences and shared realities as women. Students were transformed in this process, myself included. In 2009, about a year after leaving UNH and moving back to her native New York City where she would teach philosophy at Hunter College and NYU, Kathy was diagnosed with late stage ovarian cancer. 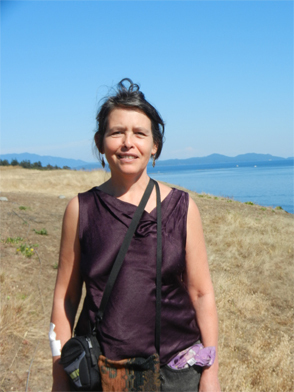 Over the next two years of successive treatment, remission and recurrence of the disease, Kathy took time off from teaching and sought treatment from an integrative oncologist. This second treatment led to a near four-year remission. During that period, Kathy and I drove with her cat to move her life from New York City to Santa Fe, New Mexico. Drawn towards the gentler pace and beauty of the western landscape, Kathy began deepening her explorations in art-making. In 2015, the disease returned and she began a course of chemotherapy treatment there in New Mexico. When that course proved ineffective, she was selected to participate in a trial treatment that also failed and led to further debilitating health crises. When her New Mexico oncologist intimated that this was the end of the road, we made the decision to relocate to the Chicago area so that Kathy could be treated again by her integrative oncologist. The last year and a half of her life spent in Evanston, just one block from a beach on Lake Michigan, proved amazingly abundant for Kathy, with deep friendships and inspiration. 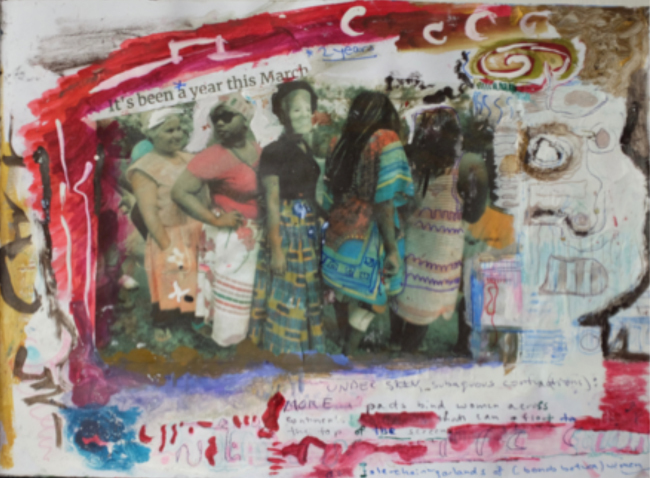 And though life followed a rhythm largely set by the complications of an advancing disease and by the increasingly harsh treatments that failed to reverse its course but helped control its symptoms, Kathy leapt ecstatically into her art-making. I often would come home from work and find her covered in paint and very happy. Along with the wonders of friendship and the fires of thinking/writing/theorizing she came not-too-late upon a life of ecstatic work and play, which delighted and surprised her.